When It Comes to Sales, This is One Smart Cookie! Yesterday as I emerged from Target, something happened that caused me to have the kind of "aha” moment you normally read about in women’s magazines. Thanks to an ordinary encounter, I’ve come up with the whole solution to our current economic crisis, and it can be summed up in just two words: Thin Mints. Before you scoff at the idea, take a look at these startling statistics. According to the official Girls Scouts of America website, during its annual six-week Cookie Sale the organization sells over 200 million boxes of cookies (I can personally account for three of them myself) at a purchase price of $3.50 per box. This translates to more than $700 million in revenue. These are not mere casual observations. I’m speaking from the voice of experience. After all, I’ve been on both sides of the box. Back in 1963 when I proudly wore the ugly brown uniform, every girl in our troop was issued a carton of twenty-four boxes which we had to haul around in a wagon door-to-door. Our leader told us in no uncertain terms that were we not to even think of coming home until every box had been sold. What she didn’t tell us was how quickly the first five customers would scarf up our limited supply of Thin Mints and Shortbread Trefoils. After those were gone, it took a pretty slick sales pitch to get rid of the weird varieties that were left. A few years later, when my daughter donned her own ugly brown uniform, the Cookie Sale was conducted by way of pre-orders. True, she still had to go door to door to take those orders, but at least the heavy lifting had been eliminated. At first I was delighted with this new method (mainly because Lauren had two sets of grandparents who practically filled her entire quota!) but that was before I did a stint as Cookie Mom. Cute as the little darlings were, the girls never turned in their order forms on time. Finally after days of cajoling and nagging I managed to end up with a stack of tattered envelopes bulging with loose pennies, and checks written in illegible handwriting for bizarre sums. Nobody’s tallies tallied. Nobody’s totals totaled. It was a mess. What’s worse, on the day the cookies arrived, I spent two hours dividing up the boxes according to each girl’s sales list. (Sarah sold nine Samoas and six Do-Si-Do’s, etc.) Then I ran to the grocery store. Big mistake. While I was gone, my younger son and his buddy hit what they considered to be the mother lode in terms of an afternoon snack. By the time I returned home, they had opened and sampled more than twenty boxes of cookies! Most of our customers were good sports (especially those who knew Jason) and I just had to buy the damaged boxes from the rest. Needless to say, I never volunteered again! Rule One: whether you’re selling pipelines or pencils or penicillin or pretzels, fire your high-powered marketing firm, grab a handful of nine-year-olds in Brownie uniforms and park them outside Target. I guarantee you’ll see your profit margin sky-rocket in the first quarter. Rule Two: Limit your selling period to just six weeks. Trust me, there’s just something about knowing an item won’t be available in July that will make your customers buy ten times more than they should in January. Rule Three: For those of you who are grappling with the thorny dilemma of what do to about corporate bonuses, there’s really only one solution that will make everyone happy. 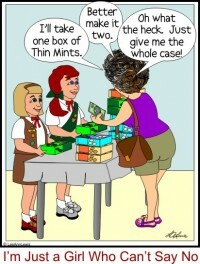 Give your CEO a carton of Thin Mints. Search for As I See It articles similar to "When It Comes to Sales, This is One Smart Cookie!. Search all articles similar to "When It Comes to Sales, This is One Smart Cookie! ".